On October 24, 2017, a reader of our website is scheduled to fly KLM Royal Dutch Airlines from Durham Teesside Valley airport in England to Amsterdam, where he will change planes to Seattle, while his final destination is Kalispell in Montana, USA. But first he calls KLM to ask whether he can use an EMD voucher issued by Delta Air Lines to pay for his excess baggage. The agent tells him all he needs to do is give the reference number at check-in and it would be fine. At check-in, however, the attendant asks for a debit card to charge him an excess baggage fee. Instead of the debit card he hands her the voucher, which states that it would cover payment for excess baggage. The clerk says: “I have never seen one of these” and turns to her colleague, who has never seen it either. Insofar we know, both the agent on the phone and the check-in attendant are wrong. Although EMD vouchers issued by Delta cannot be directly used at KLM, they can be used on Delta’s website, for example for a payment to KLM. Obviously, KLM staff’s training is insufficient in that it does not include how to use EMD vouchers. The attendant says she cannot accept the voucher and urges him to pay by debit card. When our reader refuses to give his card based on the information he received by phone, she says that his baggage will be removed from the plane to a secure room. And she adds: “If after 12 hours it is not collected we will dispose of it.” Remember that the customer will not even arrive home within 12 hours! When he arrives in the USA he calls KLM. The agent apologizes for the clerk’s error and tells him his luggage would be recovered and returned to him. This never happened. Although he was offered some electronic vouchers they failed to compensate him for the disappearance of his baggage. Interestingly, a Delta agent with whom he speaks, tries to shift the blame by suggesting to instigate a claim with Alaska Airlines as they were responsible for the final leg of his journey to Montana. We asked KLM to comment on this experience and to tell us their view of this affair. Although KLM does not deny the story, they refuse any comment. This does not seem totally incomprehensible, for even the best spin doctor would have a hard time to justify KLM’s “disposal” of a customer’s luggage. Thus, we do not know what KLM means by disposing of a passenger’s baggage. It may mean anything: auctioning off a customer’s belongings, giving them to KLM employees, destroying them, or whatever. 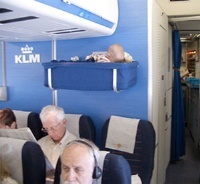 KLM refuses to specify it. We do not know either how often this occurs. But we do know that if our reader had known in advance about KLM’s disposal policy, he would have booked another carrier.